The first weekend of season 2012 is already behind us and Chonburi is sitting on top of the league. Several new foreign players gave their debut, including German Bjorn Lindemann for Army United. Military club Army United had to face promoted side Chainat FC at home and several new imports had their debut. For the home side namely, Lindemann, Danny Invincible, Mathias Recio and for Chainat José Pedrosa Galán and Kendall Jagdeosingh amongst others. After 90 minutes both sides went into the dressing room with a fairly shared 1-1. Indeed, it was not to be expected that Chainat would be easy to beat and were supported by some Hundred fans. Lindemann pulled the strings in midfield and overall performed very well but especially during the first half one could see many things not gel as they should. It was on to thee visitors and Thanakorn Kamkoma to write history for the club, while scoring Chainat's first goal in TPL. It came from set piece after 22 minutes. For most of the time during the first half Army United gave the ball away too easily, over and over again, and hardly came to decent opportunities. Besides, Bjorn Lindemann who also kicked all corner kicks, still had the best chances before the break. With one hour into the game Sarayuth Chaikamdee got a great chance to level, but Chainat's keeper pulled out a brilliant save. Thus it was left to both new imports, Mathias Recio and Björn Lindemann, to provide the final score. A great through ball by the German was picked off by Recio who chipped the ball in to the net. Already during pre-season it appeared that Recio/Lindemann could work pretty well for Army. Though Recio didn't start from the beginning and was substituted near end of second half. Maybe he gets his chance to start next weekend, against TOT SC. Meanwhile the German was named "man of the match" by Siamsport for his debut performance. Surely he can do better, once adopt to the heat, as he was running out of energy at the end of the 2nd half. However, we come to the league leaders after the first weekend. Chonburi. Like last year the "Sharks" had to take on Thai Port in their season opener and again, visitors were without any chance. Chonburi even managed to double the score compared to 13 months ago. At half time the home side was already up by three goals thank to a superb performance of new singing Krirkrit Thaweekarn. The former Sriracha FC striker and under-23 international netted two times and assisted for French Geoffrey Doumeng. Youngster Nurul Sriyankem provided for the final scoreline in injury time. For the visitors, Steven Robb was unlucky, hitting the post two times. 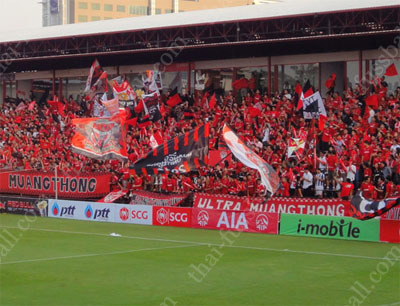 Muang Thong United against BEC-Tero with no doubt was the top-match last weekend. Datsakorn Thonglao brought his home side in front with a great shot from distance. Though with 89 minutes of play BEC-Tero equalized from the spot, it was Dagno Siaka just a few minute later giving Muang Thong a 2-1 win. However, of the day was the theatrical inserts of MTU's Christian Kouakou and a disallowed substitution. 15 minutes still to play and Gilbert Koomson received his marching order after a second yellow. As a result BEC-Tero took off Cleiton Silva, replaced by Ekaphan Inthasen. After Silva left the pitch, only two foreigners were on the field with Jovanović and Kharroubi. Takenori Hayashi should have been the next exchange for Tero, nevertheless been declined by the officials. Obviously they thought with Jovanović (Australia) there would be already one Asian player on the pitch and two are not allowed the same time. Which basically is correct (3+1) but not in case there are less than four foreigners on the field. BEC-Tero has already written a protest note to TPL and the league will decides how to handle this case. Bangkok Glass was never in danger to loose it's first match of the season against new side Wuachon United and could have even won higher than just by 2-0. Thai-Darling and BGFC new signing Teeratep Winothai, who moved in from BEC-Tero scored the second goal of the night after a superior set up by Japanese Saruta. Thai-Swiss Peter Lang, again did not play. With Wuachon nearly a complete 2nd Chonburi team stood on the field. Many players followed their former assistant coach Jadet Meelarp, now in charge for Wuachon. Last years champion Buriram, also started with a victory leaving Chiang Rai United with nearly no chance. Defender Ekwalla scored twice during the first half. BB-CU FC v Esan United had to be interrupted for five minutes after the winning goal came from Chainarong Tathong. Sisaket fans invaded the pitch in protest their club is renamed to Esan United and since this season plays in Ubon Ratchathani. You can find all results, current table and goal scorer list at usual places on our site.